Well, it's a very long time since I last heard this one, and that video is so very 80s with its zig zag background and a dancer wearing a BOY baseball cap, which was first worn by Chris Lowe of the Pet Shop Boys in 1986, I believe. I was quite a fan of 80s house and dance music (as were a couple of my friends), so this brings back so many memories for me - this track was on the car stereo pretty often let me tell you! Back in the late 80s and early 90s CD singles used to be packed with remixes. I remember that I used to waste many an hour compiling my own mix tapes to play in the car - we didn't have CD players in cars back in those days, of course! 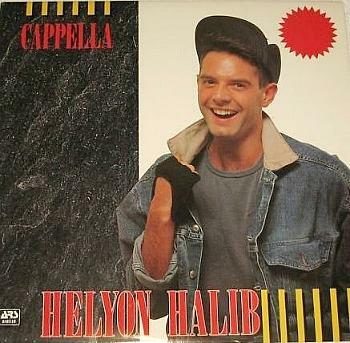 Helyom Halib was Cappella's only 80s hit in the UK and peaked at #11 in May 1989. It featured a sample of "Work it to the bone", from the 1987 track of the same name by dance music act LNR. This was a period when sampling was still pretty much in its infancy and numerous dance acts were creating some interesting sounds using the technique during the late 80s. Cappella was an Italian dance act was formed in 1987 by producer Gianfranco Bortolotti and their were several line-up changes after this. Singer Ettore Foresti featured in the line-up when they released Helyom Halib, but during their peak in the 90s the line-up featured British rapper Rodney Bishop and British dancer Kelly Overett (ex-SL2). Cappella's biggest hits were U Got 2 Know (#6 in 1993), U Got 2 Let The Music (#2 in 1993), Move On Baby (#7 in 1994) and U & Me (#10 in 1994). The Belgian single sleeve which is titled "Helyon Halib". I''ve been unable to find out why the spelling is different, but maybe this is the French title? I hope someone will enlighten me one day.